Topps has signed a new autograph deal with Bryce Harper. 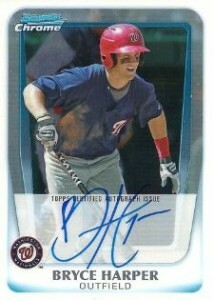 Under the multi-year agreement, Topps gains exclusive autographed trading card rights for the Nationals outfielder. The deal also makes Topps the only card company that can feature Harper on their packaging. This is the second exclusive deal between the two parties. The first was signed back in 2010. Topps said that collectors can expect Harper autographs in several products this year including 2014 Topps Chrome, 2014 Topps Five Star, 2014 Topps Update Series and 2014 Topps Triple Threads. Bryce Harper autographs can also be found in 2014 Topps Series 1 and 2014 Topps Tribute, although they are redemptions. "I am happy to be a part of the Topps family," Harper said via press release. "I still get excited when I see my Topps cards and I am glad to hear that fans are excited about them too." "Bryce has quickly become one of the biggest names in Major League Baseball," said Clay Luraschi, VP of Product Development at Topps, "At the age of 21, Harper is leading baseball’s emergence of young, extremely talented stars and collectors can’t get enough of him."